"Let me first explain what a Deer Management Group is. The deer herd in the Highlands is wild and largely unconfined by fencing. Therefore in different seasons and wind conditions, red deer will move across different grounds and estates. The traditional make up of highland estates has changed much in the last 30 years and so there will be many different ideas, or aims for land management. It is vital therefore that the different land managers speak to each other to co-ordinate and co-operate over their policy towards deer. It is generally recognised that red deer, while being a vital wild resource and the source of significant employment opportunities, may be destructive, and some areas have to receive protection from them. Again the extent and severity of that protection has to be a topic that involves all land managers in the area. 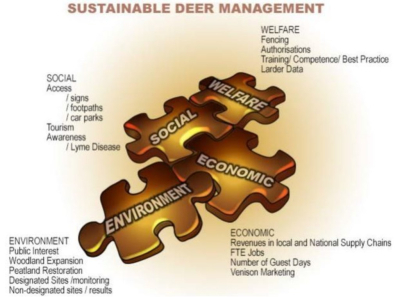 Deer management groups provide the forum for these discussions. They are composed of representatives from each estate in the group area. These groups have been evolving for over 40 years, with the impetus for that evolution being very much at the hands of the estate owners. The Cairngorms, Speyside, Deer Management Group, (the boundaries of which you can find on this site), has a unique position. It is the only group which is wholly within the Cairngorms National Park and it is one of the groups with the most diverse ownership in Scotland. The Group wishes to be at the forefront in seeking diverse opinion about the future of the red deer herd and so I commend this site to you and ask that you make appropriate comment to make this into a ‘living’ site." CSDMG operates on the basis of consensus, working with its members, agencies and others towards delivering private and public benefit outcomes. The overall aim of the DMP will be to achieve the sustainable management of the populations of native red and roe deer in the area, working in collaboration. The ‘public benefit’ is derived from legislation and strategies developed by Scottish Government. With low deer densities across the CSDMG range, collaboration with neighbouring landholdings and DMGs over managing ingress of deer will be a major challenge.